Rinse chicken and pat dry wit kitchen towel. Mix ginger, soy sauce, honey, oil & salt in a small bowl. Pour this over chicken together with spices and marinate for at least 1 hr ( I marinate overnight, covered with foil). Grill chicken under preheated grill or roast in oven set at 375 �F for 30 minutes, turning halfway through cooking time. 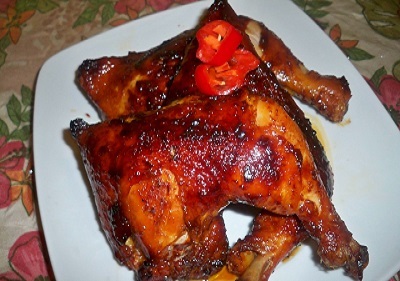 Honey roasted chicken is one of our favourite dish. I used the Malay-style recipe this time. When you smell the aroma of chicken being cooked, it was wonderful... Have it with white rice or flavoured rice or just dip it in your chilli sauce, delish!